The following document is a copy of the model memorandum of agreement with the Defense Logistics Agency that states sign as part of Law Enforcement Support Office (LESO) program to transfer excess military property to civilian law enforcement agencies. 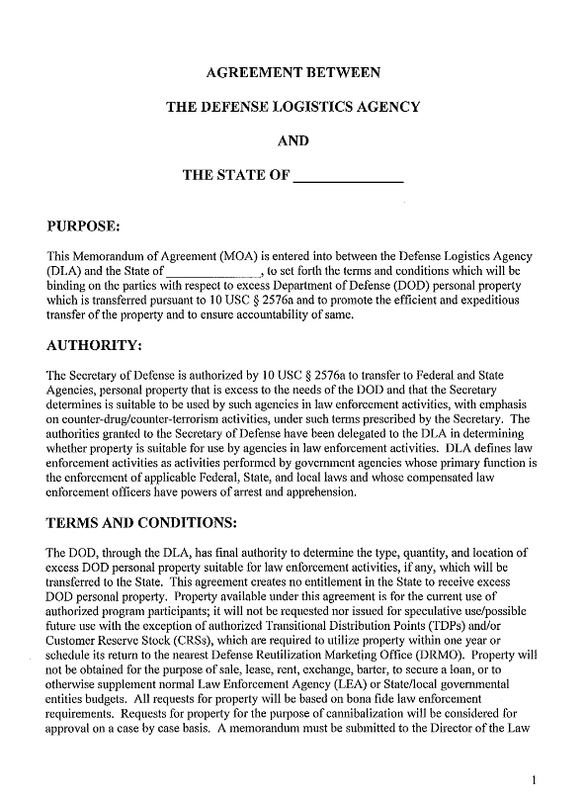 This Memorandum of Agreement (MOA) is entered into between the Defense Logistics Agency (DLA) and the State of ____________, to set forth the terms and conditions which will be binding on the parties with respect to excess Department of Defense (DOD) personal property which is transferred pursuant to 10 USC § 2576a and to promote the efficient and expeditious transfer of the property and to ensure accountability of same. The Secretary of Defense is authorized by 10 USC § 2576a to transfer to Federal and State Agencies, personal prope1iy that is excess to the needs of the DOD and that the Secretary determines is suitable to be used by such agencies in law enforcement activities, with emphasis on counter-drug/counter-terrorism activities, under such terms prescribed by the Secretary. The authorities granted to the Secretary of Defense have been delegated to the DLA in dete1mining whether prope1iy is suitable for use by agencies in law enforcement activities. DLA defines law enforcement activities as activities performed by government agencies whose primary function is the enforcement of applicable Federal, State, and local laws and whose compensated law enforcement officers have powers of an·est and apprehension. The DOD, through the DLA, has final authority to determine the type, quantity, and location of excess DOD personal prope1iy suitable for law enforcement activities, if any, which will be transferred to the State. This agreement creates no entitlement in the State to receive excess DOD personal prope1iy. Property available under this agreement is for the current use of authorized program participants; it will not be requested nor issued for speculative use/possible future use with the exception of authorized Transitional Distribution Points (TDPs) and/or Customer Reserve Stock (CRSs), which are required to utilize property within one year or schedule its return to the nearest Defense Reutilization Marketing Office (DRMO). Property will not be obtained for the purpose of sale, lease, rent, exchange, barter, to secure a loan, or to otherwise supplement normal Law Enforcement Agency (LEA) or State/local governmental entities budgets. All requests for property will be based on bona fide law enforcement requirements. Requests for prope1iy for the purpose of cannibalization will be considered for approval on a case by case basis. A memorandum must be submitted to the Director of the Law Enforcement Support Office (LESO) requesting approval. Any transportation, repair, maintenance, insurance, disposal, or other expenses associated with this excess DOD personal property is the sole responsibility of the State/LEA. The State will establish and submit to the DLA, a State Plan of Operation, developed in accordance with Federal and State law and conforming to the provisions of this MOA. This State Plan of Operation will detail organizational and operational authority including staffing and facilities. It will also address procedures for making determinations of LEA eligibility, allocation and equitable distribution of material, accountability and responsibility concerning excess DOD personal property, training and education, Operational Effectiveness Reviews (OERs), and procedures for tum-in, transfer, and disposal. Property obtained under this MOA must be placed into use within one (1) year of receipt and utilized for a minimum of one (1) year, unless the condition of the property renders it unusable. Only in special circumstances will property be obtained and held for the minimum time frames and then sold, bartered, exchanged, or traded. Approval will be considered on a case by case basis. A memorandum must be submitted to the Director of LESO requesting approval. Property will not physically move until the approval process is complete. If property is not put into use by the recipient within one (1) year, the State/LEA must contact the DLA LESO to coordinate the return of the property to the nearest DRMO for proper disposition. Once the DLA LESO is notified and a DRMO is identified, property must be returned within thirty (30) days. The State/LEA will bear the burden of returning the pro petty to the nearest DRMO. Under no circumstances will pro petty be sold or otherwise transferred to non-U.S. persons or exported. Only the Governor appointed State Coordinator identified at the end of this document is authorized to enter into this Agreement on behalf of the State. An Appointment Letter from the State Coordinator, authorizing the State Point of Contact (PO C) signature authority or to act on the behalf of the State Coordinator must be on file with the DLA LESO in order to actively participate in the program. The State Coordinator is required to sponsor LEAs that want to actively participate in the program and the State Coordinator must screen all LEAs requests for excess DOD personal property. The State Coordinator will validate that all approved requests for property are legitimate and for law enforcement purposes. In so doing, the State Coordinator assumes the responsibility to maintain records ensuring LEA accountability for all excess DOD personal property received through the I 033 Program for his/her state. In conjunction with each request, the State Coordinator will furnish a detailed justification for the property. Property received through the 1033 Program can only be distributed to an authorized LEA for whom the initial request was made and justification was provided, unless the property was requested for a TDP or from CRS. The DOD has authorized the transfer and use of excess Federal property to the State/LEA and as such reserves the right to recall any and all property issued through the 1033 or 1208 Programs. As stipulated in Federal regulation, title may be conditionally granted to the State/LEA upon receipt of the property, however approval will be considered on a case by case basis. A memorandum must be submitted to the Director of LESO requesting approval before the disposal, sale, auction, trade-in, salvage or transfer of any 1033 or 1208 property can occur. Property will not physically move until the approval process is complete. Costs of shipping or repossession of the excess DOD personal property by the U.S. Government will be borne by the LEA. To the extent permitted by law, the State Coordinator/LEA shall indemnify and hold the U.S. Government harmless from any and all actions, claims, debts, demands, judgments, liabilities, cost, and attorney’s fees missing out of, claimed on account of, or in any manner predicated upon loss of or damage to property and injuries, illness or disabilities to or death of any and all persons whatsoever, including members of the general public, or to the property of any legal or political entity including states, local and interstate bodies, in any manner caused by or contributed to by the State/LEA, its agents, servants, employees, or any person subject to its control while in, upon or about the sale site and/or the site on which the property is located, or while the prope1ty is in the possession of, used by or subject to the control of the State/LEA, its agents, servants, or employees after the prope1ty has been removed from U.S. Government control. The State will maintain or assure that the LEA maintains adequate insurance to cover damages or iJ1juries to persons or property relating to the use of the prope1ty. Self-insurance by the State/LEA is considered acceptable. The U.S. Government assumes no liability for damages or injuries to any person(s) or property arising from the use of the property.